One thing that's evident from all the hurricane coverage and even friend's Facebook updates is that there was a large range in terms of how much people were impacted by the storm. Many areas were hit mercilessly, like Breezy Point, Queens, which had massive flooding, winds, power outages, and a fire that destroyed at least 50 homes. I'm so thankful that our area (East Midtown) didn't get clobbered, that we didn't have to evacuate, and that we retained power with just a few flickers here and there. This morning, a small handful of stores and restaurants were open, and there were lots of people walking around in the neighborhood. Everything seemed almost normal, except that there was an obvious sense of liberation in the air. Apparently the local bar Pig 'n Whistle was packed last night and there was even a line at the door. No doubt, people were a bit stir crazy from the cabin fever. Plus, when you tell New Yorkers to stay home, often they just don't listen. Of course, midtown didn't come away completely unscathed. NYU Hospital in the mid 30's not only lost power yesterday evening, but their generator failed as well, forcing the hospital to transfer approximately 250 patients to other hospitals. The transfers were still happening today. The crane collapse on 57th Street happened six avenue blocks away from my apartment, and could've been fatal. The evacuation zone was just three blocks away from us. This morning I walked outside to pick up some stuff at Home Depot and I actually saw the crane clearly dangling over 57th Street, certainly not the original position of the crane. 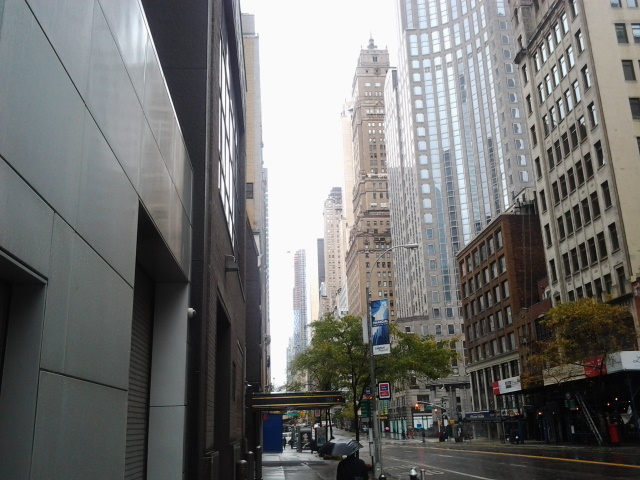 My crappy camera phone doesn't quite capture it, but you can see One57 in the center of the photo below. The small blotch next to it is the top of the crane. Apparently winds got up to 95mph up there, and the winds are still kicking hard enough right now making it unsafe to go up and lower the crane at the moment. Whenever I hear the word "dangling" again, I'm sure my mind will go back to the dangling crane over 57th Street. NEW YORK'S NEXT GREAT NEIGHBORHOOD?